The steel structure of the Assembly Hall building is starting to take shape with the first sections of the massive columns being erected. Once fully constructed, it aspires to host one of the most fascinating engineering workshops in the world. This is where the ITER components will be assembled, lifted, rotated and finally transported to their final location in the machine. Its specifications are 60 metres high, 97 metres long and 60 metres wide. The building will rely on 220 steel columns and its total structure will weigh approximately 6,000 tonnes. The first sections of the columns are already in place and measure 12 metres. Due to their impressive size they stand out from a distance on the site. Four more levels will gradually be erected in order to reach the 60 metres off the ground. Works have also been progressing on the key building of the ITER construction site that will host the machine – the Tokamak complex. Following the completion of the upper basemat, works have been advancing with the pouring of the concrete for the first walls. 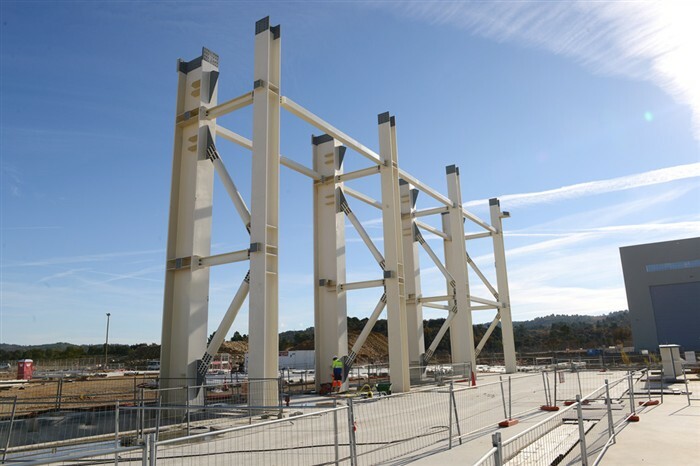 To view the progress of the ITER site click here.